Ha... Neither of them look impressed heh? I just added another picture where Ruby is actually smiling. No green milk for her! 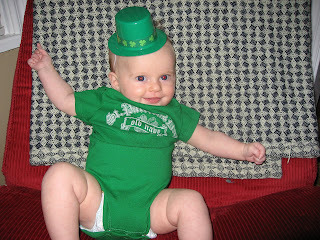 But maybe a green beer for mommy?? I don't know which ones cuter. Ahhhh--look at your girls!! That is SO cute! Quincey does NOT look happy. The second picture is too precious. She has quite the personality...you can see it in her eyes. CUTE! Haha! So cute! 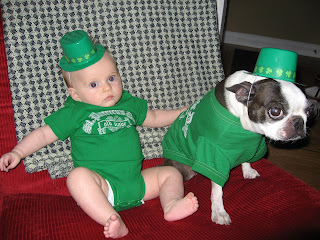 No green beer for you yet Ruby! That is adorable!!! I had a good laugh! I love her poses--it's as if she's saying, "Ta da!" Such a cute, cute little baby!